Over 10 million people in Yemen are starving, 1 in 3 children are malnourished and these are the official statistics, the reality is probably far worse than what we are being told. There is only one functioning general hospital able to deal with critical injuries, situated in the capital Sanaa. The Saudi blockade and its continued illegal aggression against these already impoverished people will go down as one of the worst and least recognised crimes against Humanity of this century. The use of suspected neutron bombs, cluster bombs, concussion bombs, chemical weapons on predominantly civilian areas is unjustifiable in any court of law and yet the UN/EU has been bribed to withdraw from investigation into these barbaric acts. Every time I see images of these little bones barely strung together with wrinkled, dehydrated flesh, its unbearably painful to contemplate what we are allowing to happen in our world. Days are spent in an almost permanent rage or grief but its nothing compared to what these people in Yemen are enduring. Our governments court these death peddlers without conscience, taking their filthy blood money without a second thought for these starving, terrified children, babies who are being born into a world of deprivation and fear. The twin purveyors of evil in the region, cultivated and fed by our governments, Israel and Saudi Arabia must be destroyed….there is no longer any alternative. 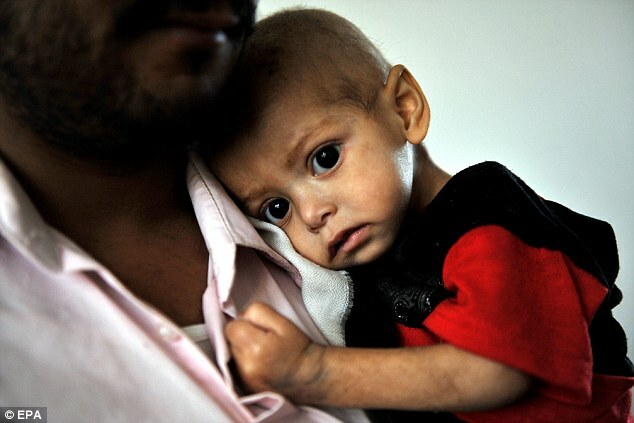 A man waits for his child to be treated for malnourishment in a Yemen therapeutic centre struggling to deal with the burgeoning health crisis in a country under bombs and blockade enforced by the Saudi regime that is bleeding them dry by every means possible. This poster image is heart rending, no child in this world needs to starve, no child needs to live under a rain of bombs or among the dust and rubble of their homes. As violence sweeps across the region it is these little one who are the innocent, fragile victims of war. These little limbs still kicking, protruding bones, teeth and eyes, a reduction of what this baby should be, eyes grown old with pain, hunger, thirst. A hand reaching out into a world that has turned away from their plight. Hassan Al-Haifi ~ “How can the world continue to watch the atrocities of the Saudi aggression in Yemen without the least of disdain on the perpetrators of these gross crimes of war and crimes against humanity? Has the world become blind of all conscience and void of all morality? October 19, 2015 in Yemen. This is heartbreaking. Incredible human suffering, for what? Power? It is indeed the forgotten crime against Humanity. Absolutely appalling. Shared to tell others what is happening . This is so wicked , utterly unconscionable , barbaric and inhuman .